Stagecoach is such a well-realized film that even parts of it that could - and probably should - fail don't. I found the movie to be much funnier than most old films. Lots of humor doesn't cross-generational barriers well, but parts of Stagecoach were laugh-out-loud funny. And yes, they were supposed to be funny - no campy snickering here. The jokes themselves aren't that hot and a lesser movie would have bombed with them, but they work here. For example, one running gag concerns the fact no passenger can accurately remember the name of one other character. That bit has massive potential to flop, but it's portrayed so gently and subtly that it actually works. I should have cringed as the gag kept going and going, but the cast offered it so honestly that it stayed entertaining. Print flaws were a more serious issue. The movie looked excessively grainy at times. I also noticed vertical lines that often ran up and down the screen as well as speckles, scratches, blotches, hairs and other debris. I’ve seen messier transfers, but I’ve also seen many cleaner ones. More satisfactory was the movie's adequate monaural audio. 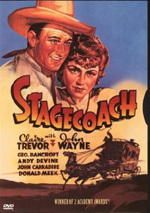 I don't expect a whole lot from old soundtracks, and Stagecoach didn't give me much, but it worked decently for a film of its era. Dialogue could occasionally be a little hard to understand, but it's usually clear and reasonably natural. Both effects and music seemed decent but somewhat tinny and flat. The track displayed a small amount of background noise but I discerned no significant distortion. Again, it's not a particularly good track, but for such an old movie, it seemed a bit better than average. Less exciting are the DVD's sparse supplements. It includes the standard decent-but-not-too-exciting Cast & Crew biographies for nine of the actors, two writers, two composers, and director Ford. These vary in quality from pretty detailed for big names like Ford or Wayne to very brief for some of the others. We also get six trailers for films from Ford and Wayne. These include Stagecoach, They Were Expendable, Fort Apache, 3 Godfathers, The Searchers, and The Wings of Eagles. The DVD tosses in a few text screens full of production notes. These come in three categories: "Making the Stage", "Monument Valley", and "The Legacy of John Ford and John Wayne". While these notes are pretty interesting, I dislike the format; they'd be more palatable if packaged all together in one section. Still, the notes add to the experience and are worth the effort. Some text that lists the awards for which the film was nominated and/or won also appears. Stagecoach is absolutely terrific and clearly deserves its status as a classic. It’s one of those rare films that makes me want to see more from its participants. Unfortunately, the DVD presents flawed picture and forgettable extras. The film’s worth a look, but this remains a disappointing release.